Here is another one that I am kicking myself for not adding to my personal collection. This piece wasn't very big, just a few grams in size, but still one of the nicest examples of gold in quartz that I have seen. Often specimens will have a darker, stained host material that isn't all that attractive. This one has the perfect blend of clean white quartz with bright, high purity gold. 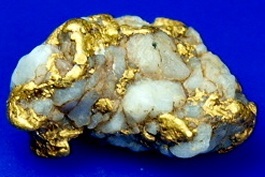 A fantastic gold specimen.